I dunno what I did, but now I can’t even get on the internet on the computer, so I’m writing this on the iPad…it’s fine, although my pointer finger gets tired. I have a tiny keyboard for it somewhere, but that requires even more thought than trying to find the network security key, which is NOT the same as a password, despite the similar feel to the words. It’s going to be short today anyway. I have an early meeting plus a packet to make for a kid who’ll be gone for over a week (sigh…so frustrating…parents just want a packet, but that means I have to find or make stuff to replace hands-on curriculum…at least this parent gave us a heads up. The other kid asked for work yesterday for the next week. No chance.). Last night, I blew off everything and went to see Rachel Ignotofsky talk about her new book, Planet Earth. She previously published Women in Science and Women in Sports, plus her Etsy site has all the prints and T-shirts I want. I am refraining from buying everything. She’s fun and creative and perky and loves talking to kids, and her next book is Women in Art! I’m excited…plus the new book is all about ecosystems and biodiversity and saving the world, which I can totally get behind. And she merges art and science in an engaging and beautiful and fascinating way. I think I just went all fangirl. I had her sign both my books. 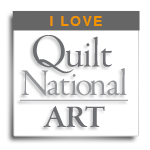 And then I came home and found out I got into Quilt + Resist at Woman Made Gallery…a gallery I’ve been trying to get into since I was an adult artmaker. Rooted in America is heading out again, this time to Chicago. Good news, that. And I also got into the Surface Design Association Exhibition in Print, so it’s been a good week for notifications. I don’t know which one will be in the magazine. But I’m looking forward to finding that out. Well hopefully when I get home, the computer will connect to things. Tonight I work on grades and art. Last night was cool and inspiring…now back to work.